Madeline Aaron and Max Settlage won the novice pairs title at the 2011 AT&T U.S. Figure Skating Championships. Madeline Aaron and her eighteen-year-old partner Max Settlage won both portions of the novice pairs competition to run away with the title in Greensboro, N.C. on Monday. The fifteen year-old Aaron competed with a high fever, but it wasn’t noticeable in her performance. Skating a sophisticated program to Tchaikovsky’s The Nutcracker, Aaron and Settlage dominated the competition besting the rest of the field by more than fourteen points. On their way to the title, the champions landed a beautiful throw triple Salchow to go along with their competition best component scores. Their score of 128.21 points in the competition was the highest score at the US Championships for novice pairs in three years. “I feel really good about winning, but I’m exhausted,” Settlage mused after the competition. Madeline, the youngest of the three Aaron siblings competing in Greensboro, is the first in the family to win a national title – an honor she hopes doesn’t last for more than twenty-four hours. Finishing in second place was the team of Chelsea Liu and Devin Perini, who were in the same position after the short program. 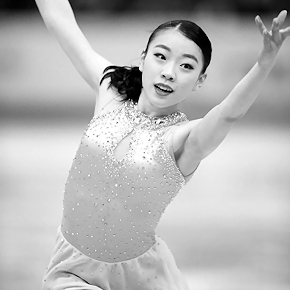 Liu, just eleven-years-old, and seventeen-year-old Perini skated to Oogaway Ascends by Hans Zimmer. “We were just trying to do the best that we can, and we really never thought about going home with a medal,” Perini said happily. The silver medalists skated with just one error- a fall on the throw triple Lutz, but managed to earn high levels on their elements to score a total of 113.90 points overall. “It was a good try, but we haven’t been doing that element for very long,” Perini explained. Moving up from fourth place to win the bronze medals were Audrey Goldberg and Joseph Dolkiewicz, while Caitlin Fields and Jason Pacini slipped from third after the short program to finish in fourth place overall.